Hello Wildcats and JV families. Season 2018 is just about to get going, but looking back the Committee has agreed that it would be a good idea to do more as a Club to document and record all of the great things that happen on and off the field. With that in mind, we have gone ahead and prepared an inaugural Yearbook for Season 2017 and hope to make this an annual event going forward. The Yearbook contains a couple of pages for each of the junior and youth teams (boys and girls), including a team photo, player list, match details, and a coach report. 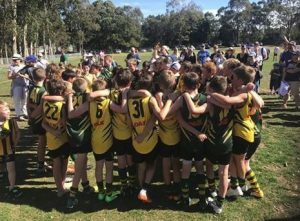 We also have photos and coach reports for the Auskick age groups. In addition, we have a report from our president giving details on what went on during the season as well as a list of milestones and player awards and a few other features. Thanks to everyone who contributed. Although there is undoubtedly room for improvement in both the design and content of the Yearbook (we are very much amateurs! ), we hope you agree that it is a good start and provides a great way to remember Season 2017. We hope players, in particular, would appreciate the opportunity to look back at the Yearbook in future years and remember all of the good times they had playing for the Wildcats and the JV teams. The next stage in the process is to see how many families would like to purchase a printed copy of the Yearbook as a souvenir. The version uploaded on the website is a low-res version, so printed copies will be higher quality and also with a hard cover. The cost of a printed copy will depend on how many we order – if we get 50 copies printed they will be about $34 each, while if we get 100 copies they will be about $27 each. So please take a look and see if you would be interested in purchasing a copy. If you would like to get a copy, please email us at recruitment.wildcats@gmail.com to register your interest. If there is enough interest after a few weeks we will then set up a link for families to purchase a copy and then go ahead with the order. In the meantime, if you see any errors or omissions in the Yearbook also please email details to the same address as it is not too late to make the necessary edits.